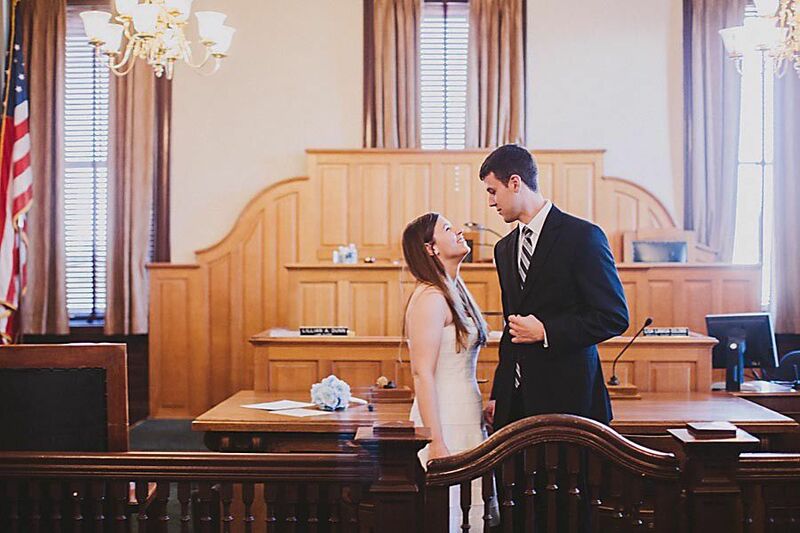 Courthouse weddings offer affordability and a sense of nostalgia. The Algiers Courthouse courtrooms can accommodate up to 50 guests. In the past, elopement meant grabbing your beloved and exchanging vows in a clandestine location far from the scrutiny (and possible disapproval) of friends and family. But the term has undergone a sea change in recent years, wedding professionals say. Now eloping couples are fleeing the massive financial undertaking weddings can entail. "Elopements have evolved from secretly getting married to just saying, 'Forget the giant party. Let's just get married and maybe celebrate later with a barbecue,'" says Maile Lani, a wedding photographer who estimates she shoots 40 to 45 traditional weddings and five to eight elopements a year. "Which I think is cool." "People are looking to spend their money wisely. Not everyone fits in the box of having a larger wedding," says Laurie Guidry Manning, director of sales and marketing at the Bourbon Orleans Hotel, which offers elopement packages. Last year, the hotel hosted 10 elopements and 50 traditional weddings. In addition to being less expensive and less stressful than traditional weddings, elopements offer an alternative for people who want flexibility in their wedding dates, don't have a lot of time to plan, are uncomfortable being the center of attention or who want the day to be less about the logistics of a large-scale event and more about each other. "Big weddings are crazy," Lani says. "It's a lot of pressure coming from 8 million angles, but there really isn't any pressure at all when you have an elopement. It's not about food or bands. All it is about is two people who love each other. I usually cry at them." Elopements can range from bare bones (the couple, an officiant and two witnesses at a courthouse) to mini-weddings (the Bourbon Orleans elopement packages include cake, Champagne, a photographer and a ceremony for up to 15 guests). Planning can be spur of the moment — you can wed the same day the urge hits you if you request the 72-hour waiting period be waived. "We can issue a 72-hour waiver if you get your (marriage) license here, and you can have it all accomplished in half an hour," says Algiers 2nd City Court Judge Ernestine "Teena" Anderson-Trahan. "It is not difficult to get (a waiver)." However, most couples opt to plan their elopements two to three months in advance, a time frame Lani and Manning both recommend. Lyn Vicknair, a graphic designer at Gambit, eloped this month. It was just Vicknair, her fiance and the photographer at a courthouse, but she scheduled everything three to four months in advance. "Contacting Maile Lani (the photographer) was my first step," Vicknair says. "We knew we wanted a photographer, because we wanted something to show the family and to document the day ourselves." After confirming the photographer's availability, Vicknair called the courthouse to schedule a wedding date. For people who don't want to get married in a courthouse, the next step would be to find an officiant. Vicknair notes that it's important to call the specific courthouse where you want to get married, because each judge's schedule is different. "They were surprised I scheduled it that far out — I called three months in advance. But they were very nice," she says. That left plenty of time to collect the wedding-day essentials: rings; a Champagne-colored Trashy Diva dress and purple Toms for the bride; a suit for the groom; and haircuts. Vicknair bought loose purple flowers for her bouquet and assembled it the morning of the wedding using plant wire and ribbon. "My bouquet cost under $20. The whole wedding (including the dress, photographer, marriage license and judge's fee) cost around $500," Vicknair says. "It could be done for less, and it could definitely be done for way more." Anderson-Trahan says it costs a total of $107.50 to get married at the Algiers Courthouse, which at 116 years old is the third-oldest operating courthouse in the country. 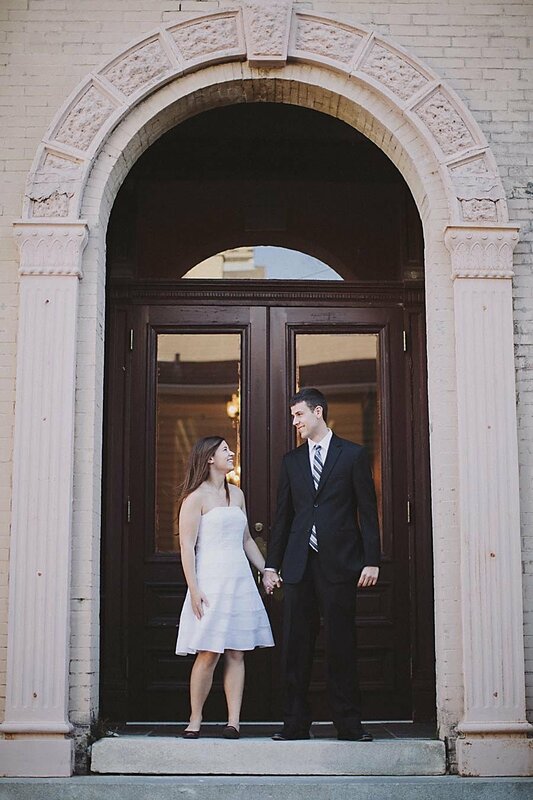 "You can conduct the ceremony in the courthouse, the chambers or on the balcony overlooking the river. It's $107.50 even if you want to bring 50 people," she says. "People like the courthouse's nostalgic flair." Lani says City Park, Pirate's Alley, Jackson Square and the Tree of Life in Audubon Park are other popular places for couples to elope. She cautions that a permit is required to shoot commercial bridal photography at most locations in the city. "They are around $50. It's really easy to get a permit," Lani says. "Contact whoever is in charge (at the venue)." Vicknair and her husband Darrin followed their ceremony with cupcakes, Champagne and a photo shoot on the levee. The courthouse was unsightly, Vicknair says, so they took no photos there. "Research the exteriors of your courthouse, because you don't realize until you take pictures how ugly the building is," Vicknair says. "There are a lot of courthouses you can easily get married in." Lani advises couples, especially those coming from out of town, to keep in mind other events that might be happening in the city. "Pay attention to conventions and festivals that are going on, because if you're doing it on a budget, they make it more expensive," Lani says. Vicknair says eloping couples might also need to prepare themselves for negative reactions from friends and family. "I did have to do a lot of 'I'm not pregnants' before the wedding," she says. Etiquette dictates that couples who elope can send out wedding announcements, but they shouldn't request gifts. Instead, a friend can be enlisted to distribute idea lists or registries to people who want to congratulate the couple with a gift. Couples also may ask the friend to request contributions for their honeymoon funds. Vicknair says her family's reactions to her elopement have been positive, and she is glad she opted to skip the big wedding. "We wanted that day to be about us," she says. "It was our relationship and our step that we were taking. We wanted to commit our lives to each other and then go have fun and celebrate it. I was so happy with how it turned out."